I recently got into a discussion with a professor friend of mine for whom I have the greatest respect, and we disagreed on what should be in a Mission Statement. He held that the library mission should be the same as that of the school. I argued that it needed to align with the school’s mission, but had to declare the unique role of the school library program. While we will agree to disagree, I wanted to bring the issue to this blog. I first blogged about writing a Mission Statement June 8, 2015. At that time I wanted to have librarians recognize the value of having a mission. 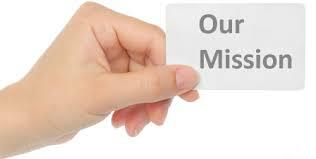 What is the purpose (or the mission) of a Mission Statement? The mission defines your purpose—what you and your library program do. It should highlight what makes you unique and vital to the educational community and expressed in words laymen can understand. You can start with the mission AASL gives in Empower Learners: Guidelines for School Library Media Programs (ALA, 2009). 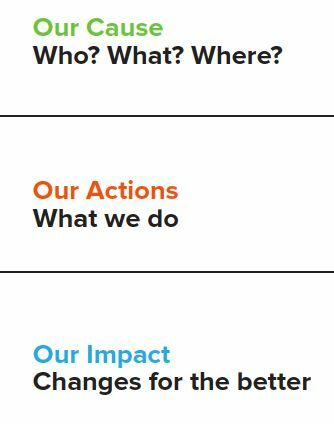 And while we need to use evidenced-based practice to ensure we have the best possible program and use the data produced by it to show our administrators what we contribute, it doesn’t mean we don’t need a Mission Statement. Everyone needs to see what our purpose is. I recommend that librarians frame their Mission Statement and hang it where it can be seen by all who come into the library. It is our declaration of why we are vital to the school – the students, teachers, and by extension the administration. It highlights what we do that’s unique. Because if we aren’t unique, we are redundant. Someone else is doing we what we’re doing – so they don’t need us. My point is a mission centers you. Even if events in the school pull you off it on occasion – or regularly – at least you are aware that it’s happening and can work to get back on track the next day. It also becomes central to all planning. You want to start a Makerspace? Fine. How does it fit into your Mission? That’s what you need to consider every time you plan a project. It helps propel you forward. 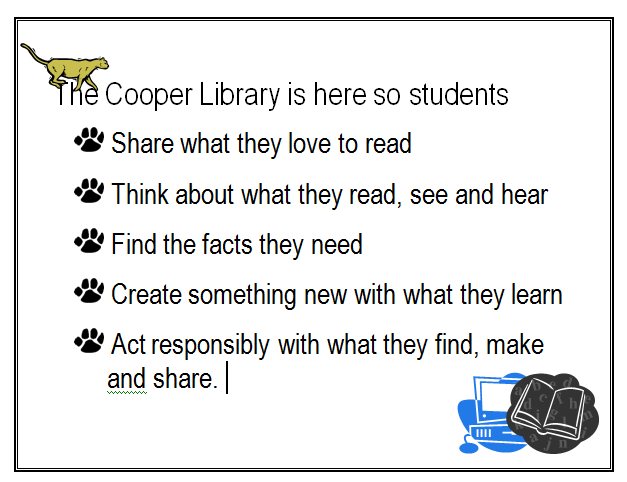 The mission of the ______ School Library is to provide students with the opportunity to become not only lifelong users of information but also creators of information. The library strengthens the curriculum by collaborating with teachers, developing a collection that is representative of the community, and implementing literacy instruction for students. The Mission of the _______ School Media Center Program is to create lifelong learners with critical thinking skills, and an appreciation of literature by providing opportunities for all students to gain the self-confidence necessary to successfully learn in an information-rich world. It is a place of safety and learning for all. The mission of the School Library Media Program is to ensure that students and staff are effective users and producers of ideas and information, promote literacy, and develop students’ competencies to be ethical participants in a global society. The ______ District Library Media Program cultivates independent, lifelong readers fosters critical thinking skills, teaches the effective and ethical use of information sources, and promotes equitable access to all forms of information media. The ______ School Library Media Program creates a 21stcentury environment that promotes learning for all students by providing equitable access to information, teaching information literacy skills, and encouraging lifelong learning. The library media center strives to be a center of collaborative learning that produces creative students who have an appreciation of literature, critical thinking skills, and a respect for others and self. The ________ School Library mission is to empower and inspire all students to apply the knowledge, skills, and attitudes necessary to become creative thinkers and problem solvers, to experience individual and team success, and to become responsible, contributing members of our community. What’s your Mission? Do you think it should be the same as the school’s or do you see the value of having one that shows you are unique?